‘On Tuesday 9 October 2012, she almost paid the ultimate price. Shot in the head at point-blank range while riding the bus home from school, she was not expected to survive. Instead, Malala’s miraculous recovery has taken her on an extraordinary journey from a remote valley in northern Pakistan to the halls of the United Nations in New York. At sixteen, she has become a global symbol of peaceful protest and the youngest ever nominee for the Nobel Peace Prize. 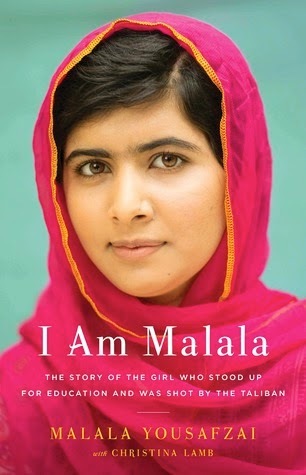 I am Malala is the remarkable tale of a family uprooted by global terrorism, of the fight for girls’ education, and of Malala’s parents’ fierce love for their daughter in a society that prizes sons. The incident that took place on 12th October, 2012 had taken the world by storm. It was just another mundane day for the teenage blogger / activist, Malala Yousafzai who was returning from school when all of a sudden; her bus was stopped by two men who posed a question to everyone, ‘Who is Malala?’ and before too long she was shot at point blank range and in no time, tehreek-i-taliban Pakistan (TTP) claimed responsibility for the attack. To begin with, I’d say the story was structured very well with clear temporal and situational demarcation. In most autobiographies, the lack of this feature is the problem that readers usually face (though, to be fair on them others, Malala just had to cover fourteen years). The first part of the autobiography is on her life in Swat before the entry of taliban, and begins with her father celebrating her birth, which is unusual considering how Pashtuns are a society that prizes sons. Then she goes on to describe her humble origins where money was scarce and her father was pursuing his dream of starting a school in Mingora, the largest town in the Swat valley and the eventual beginning of the realisation of the dream – describing the founding of Khushal Public School (named after the family’s first son, Malala’s younger brother) and how it grew step by step. Malala drew inspiration from her father and developed similar ideologies, be it on the emphasis on education, the love for poetry, oratory, devotion to Islam and also with regard to the disagreement with taliban’s interpretation of the same. It was also good as to how; sufficient focus was shown on giving a reader an insight into the history of the Swat valley (I fail to understand how she feels it is a valley of peace when it is a part of the Pashtun tradition to carry a rifle with them), the history of Pashtuns, their traditions (The Pashtunwali code), the history of Pakistan (need not be very relevant for a reader like myself considering I’m from the neighbouring country and I don’t need any further insight, but certainly for all useful for all the readers outside South Asia). The second phase of the autobiography was my favourite where she beautifully brings out the gradually changing environment in Swat with the entry of the taliban. I had always wondered as to how the taliban had such a strong support among the locals, be it Helmand, South Waziristan or Swat Valley, Malala gave me the answer as to how the warlords portray themselves as pious people to begin with and win the minds of the people and then, eventually get on with their own agenda. That transition in Swat valley was brought out very well during the second phase as to how taliban gradually began to exploit the trust that the locals had in them and whatever they had taken for granted, such as attending school, singing, dancing, films, television were all banned by them, virtually making the locals prisoners in their own valley (such restrictions would certainly be difficult for someone like Malala considering she is a fan of Western works like Twilight). The third and fourth phase are what people all over the world know better, that is, the shooting and the aftermath, the only irony that the reader could enjoy is this was possibly one scenario where the Pakistani Army and the Government were on the same page, that is saving Malala at any cost. The only negative aspect I found in the book was the involvement of Christina Lamb; while I presume she’d have done a commendable job in fine-tuning the work and editing (after all, good editing is when the reader doesn’t get to feel the editor’s work), however, the originality was lost. While I’m sure that giving an insight into the politics and history of Pakistan would’ve been her work which was one of her positive contributions but at the same time, with the reader easily able to spot who wrote what isn’t exactly a good sign. For instance, Malala, who doesn’t even know where Birmingham is, there is no way she could’ve made a comparison between the radius of the earthquake in Pakistan in 2005 covering an area close to the size of the US state of Connecticut. I personally feel that the book would’ve been much better had it fully been her own which would’ve been the easiest way of conveying her thoughts and ideologies to the reader. What makes me really admire Malala is her courage – contrary to the popular belief that she got famous only because of being shot by the taliban; she has been campaigning on this issue for a really long time which is what had brought her into their radar. However, despite the threats that she received, neither her father nor did she budge, and instead, she threw her pseudonym off and started appearing on TV – a sort of courage that is hard to find. Another reason why I admire her is her agenda – that is education for all, irrespective of gender. I’ve known activists who run a single point agenda on girls’ education whereas totally ignoring the other 50% of the population, especially when there are a considerable number of children being denied the privilege of education in that 50% and Malala is certainly not one such activist and certainly runs a much broader agenda and I hope she continues to campaign for the cause even though she is in a place far away from her home where she longs to return (which I guess is unlikely, considering all the appalling conspiracy theories that I hear in the neighbouring countries – even in well-known newspapers). On the whole, I’d say that this book is an excellent read on all grounds, the content, information, the way in which her experience was presented, her language (I don’t know to what extent Christina Lamb is involved, while I know that Malala speaks English very well, I can’t really comment much on her writing skills) and was completely worth the money that I had paid for it. I’d also like to thank the publisher who cleverly hid Kashmir in the map of Pakistan that was shown for the reader’s comfort before the prologue because had they taken any stance on the demarcation, even if they had plotted the actual jurisdiction, I might have not had the privilege to read the book in my country of residence considering how 31 issues of the British magazine, The Economist was banned back in 2009 over the same issue. As always, I shall not rate an autobiography, however, I’d say that it is an excellent read which could be recommended to anyone.